Small cap stocks (Russell 2000 Index) continues to lead the stock market higher. As I demonstrated in a study last week, the Russell leading the S&P 500 is a medium term bullish sign for the stock market. We can look at this idea from another angle. The Russell 2000 has gone up 6 weeks in a row right now for the first time since mid-2017. This is the return of “strong momentum” for small cap stocks. 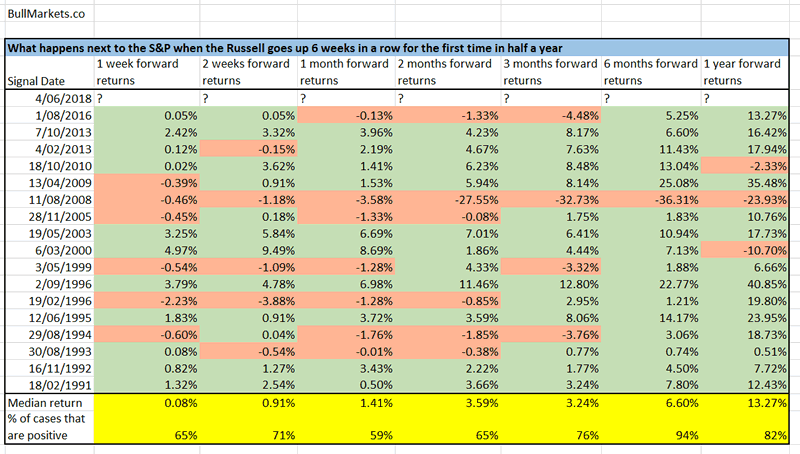 Here are the historical cases in which “momentum returned” to the Russell (i.e. Russell went up 6 weeks in a row for the first time in 6 months), and what happened next to the S&P 500. Notice how the S&P’s returns on a 6 month forward basis are extremely bullish. The S&P went up in 17 out of 18 historical cases. 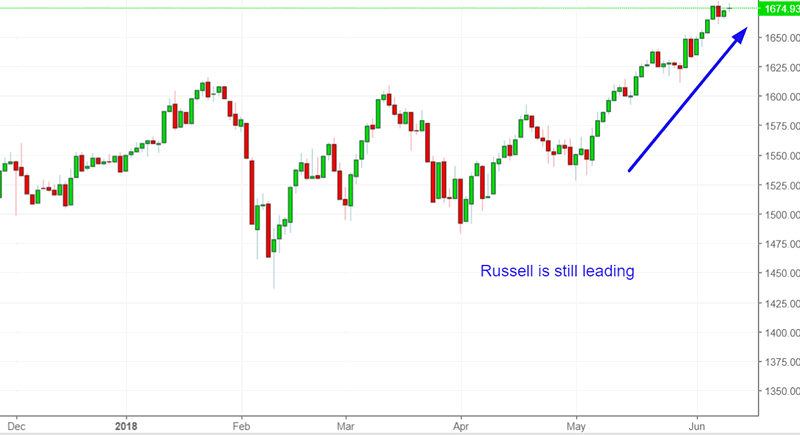 The August 2008 Russell rally occurred after the Russell had already fallen -25%. Today, the Russell has gone up 6 weeks in a row while making new all-time highs. In addition, the economy was clearly going to hell by August 2008. The economy is doing well today. So if we exclude that 1 bearish historical case which has a very different background from today, this is an extremely bullish sign for the stock market on a 6 month forward basis.